My students come to the studio filled to the brim with ideas to create and make meaning. In a choice based studio, while themes can often lend a helping hand to a stuck artist, it is quite often that students plan before class, or know immediately when they enter the studio what they want to explore. 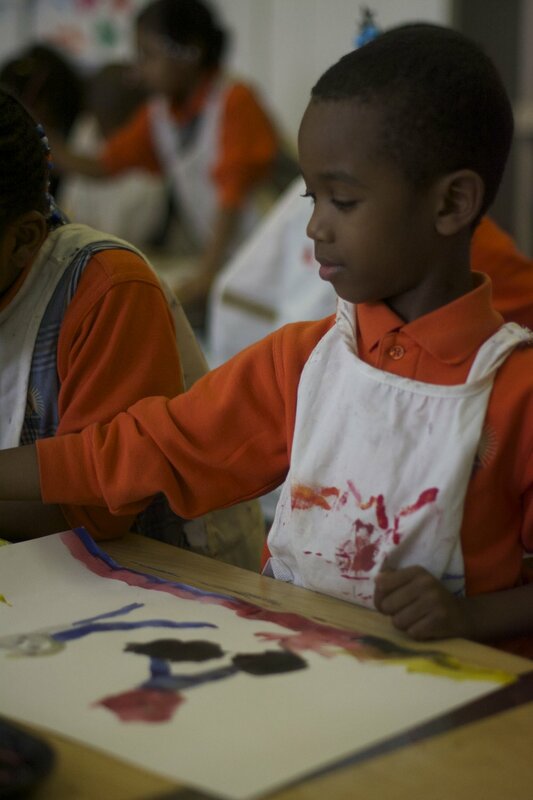 This kindergartener is making a primary color painting about a family trip to the pool. When I begin each year in the studio, our focus is on loving kindness and community. We discuss how to help one another, how to use materials properly, to share and clean up, and how to encourage and support one another as artists. Students pick their own seats, their own centers, and are free to move about the space as they please. the studio is a community, it is their shared creative space. Each material is introduced to scholars as something to explore. The beginning of the unit, or anytime I open a center, involves open play with material, starting in kindergarten and continuing through high school. A tenth grader can play with monoprint similarly to the methods in which a first grader explores clay. This exploration period allows artists to be open to possibilities without the pressure of a finished product in their novice stages. Without this element of no pressure play, artists can become closed off and fearful to make mistakes. Play is learning, and all artists play.